Money can be put into a purse through the Savings Bank, postal order, etc., in all the usual ways, and also through dealers, specialized ATMs. Currency: you receive wallets or ruble, dollar, euro and hryvnia accounts. Security - WebMoney pays great attention to the protection of funds, so when registering Be careful, you need to correctly specify your email, which will come and will be periodically received the activation code. Of course remember the password, make a copy of the protection key. And do not forget the personal activation code, nobody knows except it and it does not recover. Also it is necessary download And install the program WebMoney Keeper, configure Internet Explorer (another browser will not work), but all of this is explained in detail step by step on the WebMoney website. If we reinstall Windows, or changed a computer, you will need a personal activation code. Get money is only possible with a merchant's certificate. Certificates - another form of protection against fraud. Registering you immediately get an anonymous certificate. With such a certificate, you and only you can put it on your wallet through a savings bank, postal order, etc., but not through Internet payment systems. To be eligible to accept payments, you need to obtain a merchant's certificate. To do this, you need to download the application form, notarize it (the notary certifies only the signature) and send (or transmit, if possible) a photocopy of the passport to WebMoney. Registration fee (usually $10). There are cases when without any registration a person takes money for a wallet with an anonymous certificate. There are scammers who use this system and it defines them as scammers. 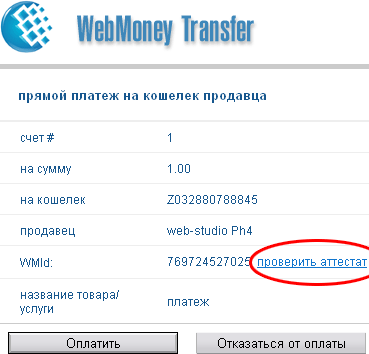 But the WebMoney system does not close accounts, but simply informs that they are scammers. So the availability of the certificate does not guarantee reliability. The certificate should be looked at at actual payment. I can make reference to anyone's certificate, but when paying attention to the link check the certificate, then you see exactly the certificate of the wallet to which you make the payment, see the screenshot below. Check the certificate WM identifier - you can check the certificate by WMID or by purse number. Select Confirm operations and click Disable in front of SMS Confirmation.